Pound to a smooth paste 1 oz. butter, 2 hard-boiled yolks of eggs, 4 washed and boned anchovies or ½ oz. anchovy paste, with 1 tea spoon Madras Chutney, salt and Cayenne to taste, and spread on to fried croutons, raising it in a dome shape, and smoothing over with a warm, wet knife. Have ready some stoned olives, filled with stiffly-whipped cream flavoured with Coralline pepper, and put on the top of each little mound a little round of egg white encircling each olive. From the Wool Wool Cookery Book, 1903. Is it just me, or have tastes changed somewhat in the last 100 years? As part of some training material I have been writing for a client, I have revisited some related work I was engaged in some years ago. One of the other authors I was working with then wrote a chapter on culture. This work quoted a piece called Cultural variations in the cross-border transfer of organisational knowledge: an integrative framework, by R S Bhagat and others, from a 2002 edition of the Academy of Management Review. 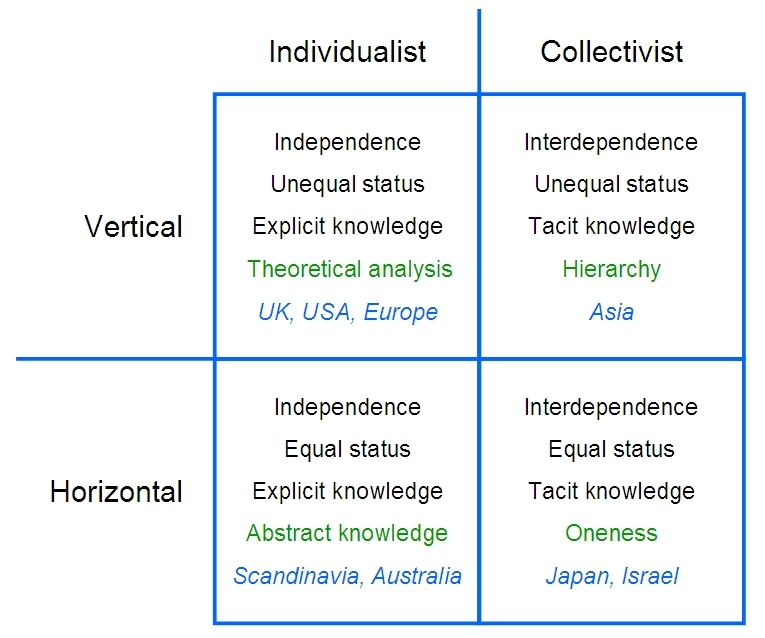 Both types of culture in the left column are independent and individualist, and predominantly Western. The top left quadrant is the domain of the rugged individualists. They are mostly found in France, Germany, the UK and USA. These people see each other as unique, and accept inequalities. Thus they can naturally accept a social class structure. They tend to hoard knowledge, and see this knowledge hoarding as power. They like theoretical analysis. 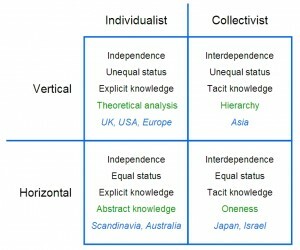 The horizontal individualists in the bottom left domain see themselves as equal in status with each other. Bhagat et al state that they also have “a relatively high tolerance for ambiguity and complexity”. They are mostly found in Denmark, Sweden and Australia. This is of particular interest, and will be discussed further.